Eating wild is MUCH more than just learning a few plants. Sure, edible wild plants help you stay healthy, but they also invite you on a journey of deep nature connection. It becomes a true adventure, and an opportunity to experience the rich connections that our earth based ancestors enjoyed. There is lots of info out there on edible wild plants, but very little that guides you on a journey of deep nature connection. Once you experience a holistic journey of connecting deeply with the natural world, you'll find it WAY easier to learn edible wild plants! 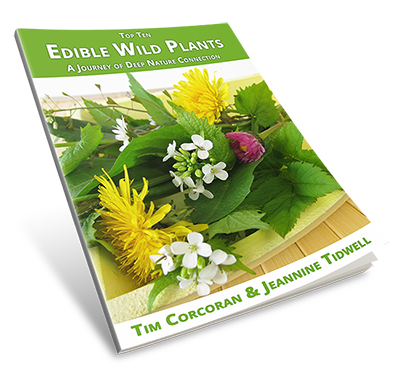 25 delicious edible wild plant recipes! Plus, our tried and true holistic approach to learning edible wild plants! Just type in your email address and first name in the boxes below, then click the "Download!" button to receive your free Edible Wild Plants eBook! You'll love this journey of connection! You'll also receive a complimentary subscription to our monthly eNewsletter, which includes special deep nature connection articles, program updates, exclusive program discounts, and more! We hate spam and promise to keep your email address safe.